Frühjahrsmüdigkeit! That’s what it is, Spring Fever! Who can blame us, after all the weather has thrown at us over the past few weeks, today is glorious and nearly 60 degrees! So…Spring Fever and all the thoughts that surface as a result will filter through this report to my colleagues. Poet Rotarian Bob Gee delivered the invocation, and considering his vocation exactly on time and perfectly in rhyme. 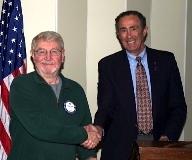 He was followed by Past President , Past District Governor Gordy Quick who led us in the pledge to our flag. 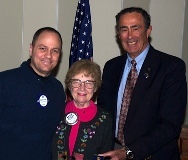 A newer member of Clover Park Rotary, Joyce Loveday was introduced as a visiting Rotarian by Bill Young, who is a member in both Lakewood and Clover Park Clubs. Jan Luze was back with the Sunshine Report. She offered to fill in for the missing program as she was armed with new pictures of her great grandchildren. Jan mentioned that she had heard from Jim Early that former member, Stan Kanaroski had recently lost his wife. Martha and Bill Larkin are off to Mexico, so Bill must be feeling better. Lastly, Mary Moss had shared with Jan that John Floyd Taylor passed away this week. He is a Lakewood resident and Grandfather of news anchor, Joyce Taylor. President Ben thanked the membership following a call for volunteers last meeting. He recalled that he asked members to come forward and fill positions needed as Sgt At Arms, club photographer at meetings and scribe positions and other club service needs. (Friends….this is easy duty!) He thanked members (tongue in cheek) for not flooding the email boxes of Bill Price and Greg Rediske in your eagerness to step up! Come on people…. Then….Ben did the thing all scribes fear most. He rattled off a litany of thought, shot full of acronyms. EEEEEEEEEEEEEEK! No way to keep up! This, he explained, was exactly the point. New members and guests will never know what is said at meetings if we all speak in acronyms. Okay, Boss…we get it! "All that is gold does not glitter, not all those who wander are lost; the old that is strong does not wither, deep roots are not reached by the frost. From the ashes a fire shall be woken, a light from the shadows shall SPRING: renewed shall be blade that was broken, the crownless again shall be king." During March….64 teams are identified, apparently in a random system that doesn’t take into account win-loss records, but perhaps uniform design and popularity….or in some cases, lack of uniforms and obscurity. These teams then are shuffled and placed on a grid to play other teams. If you lose one game, you leave and watch re-runs of your past seasons highlight films with your teammates. But if you win, you get carried around the court on the shoulders of your teammates and are on to the next match, bout, contest….thing. Repeat this for all 64 teams. Finally, you get down to the contest that will envelop all Lakewood Rotarians into the spirit of Sportsbook competition….Sweet 16. President Ben reminded us that the DLTA – District Leadership & Training Assembly will take place in Victoria on March 31- April 1. The District Conference, also to be held in Victoria, will occur June 22-24. Rumor has it that Diver Dan was actually John Lowney, and that Ranger Rick bore some resemblance to The Fruitful Gourmet, aka Rick Selden. Excellent diguises, at any rate! Ranger Rick shared that the catering this year would be by Lakewood restaurateur and CP Rotarian, Ellie Carr of Carrs! It is quite a feast at a remarkable price. You won’t want to miss it! Gayle Selden mentioned that she had secured a cruise on the Costa Concordia where every room was water view and all drinks were served "on the rocks". Ha ha ha ha ha…. Judy Hosea described that we did actually have a 7-day cruise for two on any of the Holland America cruises to New England, Mexico, Alaska or the Caribbean. This is cruise only, based on an outside cabin on one of the finest cruise lines afloat (heavy on the "afloat" part). The value ranges from $1600 - $3200 depending upon the cruise chosen. If you are thinking of taking a cruise this year, why not support Rotary and come and bid on this one! 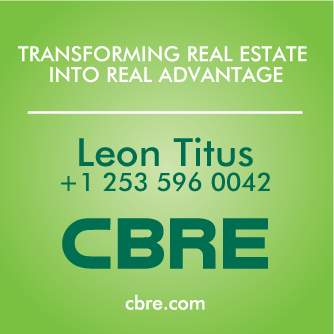 How about an African Safari? This has been a popular item in the past and lauded highly by those who have gone. We have Paramount Club tickets to "Cats" April 20 paired with an overnight package with dinner, breakfast and parking at the Washington Athletic Club. We have a trip for two on a Pilot Boat out of Port Angeles to greet an incoming cargo ship combined with an overnight at the Red Lion. There are wine packages, movie packages, the "Good, the Bad and the Ugly" liquor packages and more. 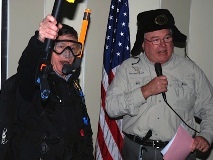 RANGER RICK- Yes time is short and we don’t have time to waste- We need another $100,000 in auction items and we need 400 guests to attend. Past President Gary Fulton is the Chair of the Foundation Committee for our club. 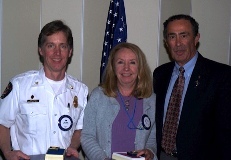 Today he presented two Rotarians with their first Paul Harris Fellowship awards. A Paul Harris Fellowship is awarded when contributions to the Foundation reach $1000. Jim Sharp and Rose Stevens both received this honor. This year, our clubs contributions to the RI Foundation have reached $28,200 making our total in our clubs history nearly $800,000. Bob Gee (yes, resident poet, Bob Gee), received his second Paul Harris Fellowship. Mary Lou and Ben Sclair came forward to accept Past President and Past District Governor Dave Sclair’s ninth Paul Harris Fellowship Award. 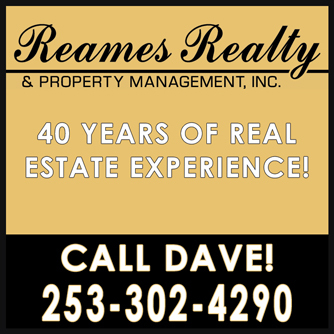 Dave was committed to the Foundation during his lifetime and in his passing, bequeathed $10,000 to the permanent fund where Dave’s impact will be felt into perpetuity. Thank you Dave, Mary Lou and Ben. Also thank you to Rose, Jim and Bob. This is leadership by example. Between Gary Fulton and Mike McGowan, the important history of our club’s involvement with the RI Foundation was shared. We have bragging rights for leadership in the number and percentage of members engaged in giving to the Foundation over time, as well as the start of the $2 a week club that has been reapplied in many clubs throughout Rotary. An important message shared was the types of funds available to accept donations. The Operating Fund kicks back 50% of contributions to the district and those funds are accessed by clubs to support a variety of local projects. The Permanent Fund is an endowed fund where only the interest is spent. There are also other restricted funds such as Polio Plus. All members are encouraged to participate in Foundation activities and work toward obtaining your Paul Harris Fellowship. Beyond that, RI has a Benefactor Fund for Rotarians who indicated the intent to leave $1000 or greater in their estate plans. Local Rotarians Fabian, Johnson and Reeder will draw up a codicil to your will at no cost for Rotarians who wish to do this. At a level of $10,000 or greater, you are eligible to join Rotary international’s Bequest Society. If you have questions, contact Mike McGowan or Gary Fulton for additional information. The winning raffle ticket was in the hands of Jan Luze. Not hearing a collective groan/cheer…I am assuming she was handed the consolation prize of $5. And for you Lakewood Rotarians from the mid 1980's, below is our exchange student from back then, Yukiko Onishi, who stayed with the Covey's among others. 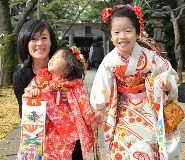 In this picture, she is with her lovely daughters, in traditional garb for some ceremony.